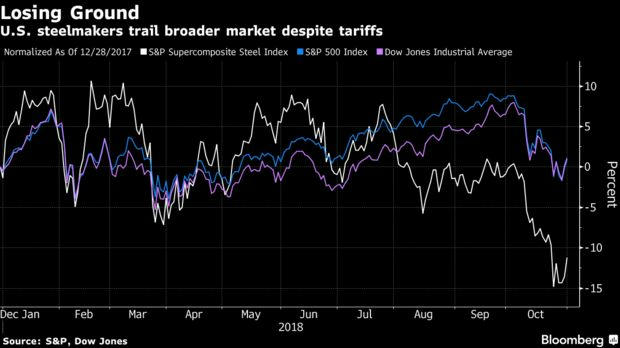 The largest U.S. aluminum and steel producers -- companies that were supposed to benefit from tariffs -- have all lost value this year. 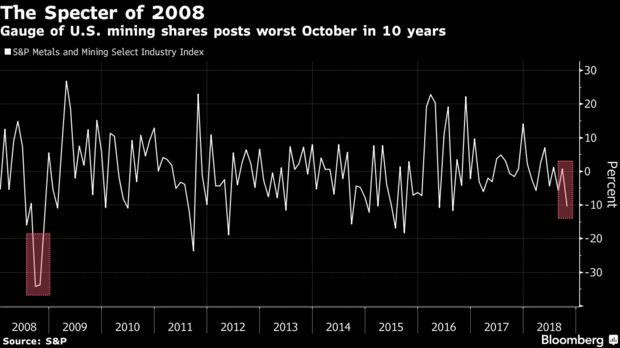 Shares of every major U.S. steel and aluminum producer are down for the year, while Century Aluminum Co. and Alcoa Corp., the country's two biggest aluminum makers, had the worst October since 2008. It was the biggest October drop since 2009 for U.S. Steel Corp., which reports quarterly earnings Thursday afternoon. The sell-off last month outpaced a broader market slump in the worst month for global equities in more than six years. Companies in metals and mining have been hit especially hard amid concern that the rising trade frictions from the tariffs have helped crimp economic growth. That's eroded metal prices that initially surged when the U.S. announced the levies. The S&P Supercomposite Steel Index has slid 8 percent this year, and fell further behind stock-market gauges in October. "The verdict the market has been rendering the past few weeks is this uneasiness and anxiety about the overarching macroeconomic picture, and there are increasing questions about the stress points emerging in the global economy," John Mothersole, an analyst for IHS in Washington, said in a telephone interview.